This review by Julie Jensen originally appeared in the November/December 2018 issue of Northern Gardener magazine. If you’re not interested in yet another technique for making “black gold” or killing off buckthorn but want to spend a few minutes thinking about gardening, reach for Potted and Pruned: Living a Gardening Life (Gardenvangelist Books, 2017). 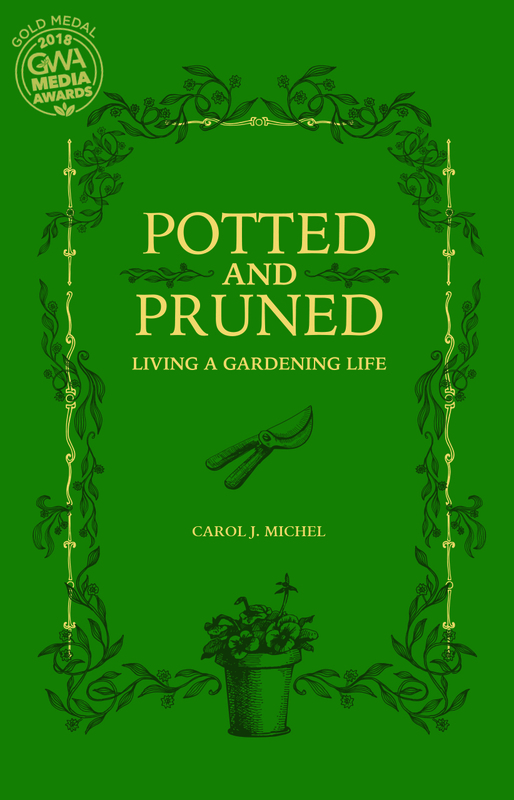 Carol J. Michel’s award-winning collection of essays covers the gamut of gardening issues, many of which I’ve not seen addressed in other horticultural books. Regarding names, Michel has a quick and easy technique for making sure you always know the botanical name of any plant you see. She also can help you identify various illnesses to which gardeners are particularly susceptible. And who among us doesn’t want a few more cuss words in our back pocket, especially those that can be deployed when judgmental neighbors or small children are in the yard? Speaking of words, Michel has several essays that address the phenomenon of words that mean something different to gardeners than the rest of society, such as rare in cultivation or just a minute. There are some essays in a more instructional vein. Michel does, after all, have a bachelor’s degree in horticultural production and a garden blog (maydreamsgardens.com). I particularly appreciated her takes on the pomodoro time management technique and how to approach speed weeding. But Potted and Pruned is, in the main, a little book to tuck away by a comfortable chair and pull out when you need a break, a laugh and a bit of gardening time.